The most common form of natural progesterone therapy is through the application of progesterone creams. Natural progesterone cream is an easy way to balance hormones and relieve the symptoms of estrogen dominance, menopause and to increase low progesterone levels in women trying to conceive, and much more. Creams are considered more effective than taking capsules, because when the capsule is taken orally, much of the progesterone will get filtered through your body and not applied correctly. Luteal Phase Defect: Progesterone creams have been shown to help lengthen a short luteal phase. A luteal phase defect does not allow enough time for the fertilized embryo to implant into the uterus. Getting enough progesterone is essential to prepare the lining of the uterus for pregnancy implantation. Miscarriage: In miscarriages due to low progesterone, the creams can help to provide your body with this necessary hormone. High progesterone levels are needed to sustain a pregnancy and if it is too low pregnancy loss can occur. Using from 100 to 200 mg per day after ovulation while trying to conceive can help with implantation of the fertilized egg. Then when pregnancy is confirmed continue to apply the cream daily until at least the 10th week of pregnancy when the placenta takes over production. Wean off slowly so as not to have a sudden drop in progesterone levels. If it any time you spot or bleed then continue using the cream until birth. Make sure you talk about this with your health-care provider. Estrogen Dominance: Unnaturally high levels of estrogen due to xenoestrogens or estrogenic chemicals (also know as endocrine disruptors) is a problem many of us face, including men. These chemical estrogens are everywhere; in the foods we eat (pesticides, unnatural hormones from injections in meat and dairy, personal care (hygiene) products, air, plastic food containers, and so on. This all causes an imbalance of hormones in our bodies and can have serious side effects. Use a natural bio-identical progesterone cream to counter the effects of these unnatural estrogens for 3 months and see how much better you feel, though you should start to feel much better after 10 days, it generally take longer to feel the full benefits of using the creams. PCOS: The use of natural progesterone is crucial part of a natural treatment regimen for women with poly-cystic ovaries. Getting between 150-250mg/day of progesterone can help stabilize blood sugar and suppresses androgen production, both known to be out of normal ranges in women with PCOS. It also helps to correct ovarian malfunction. Also make sure to get plenty of vitamin D (at least 5000 IU per day) as lack of vitamin D can reduce the effectiveness of the progesterone and is believed to be the main contributing factor in PCO. Menopause: The creams are a safe progesterone supplement for older women because they help offset potentially serious health effects and miscarriages. Women with elevated estrogen levels, which tend to happen just before and during menopause, are more susceptible to several types of cancer, osteoporosis, and miscarriages. Natural progesterone therapy is an easy and safe way to counter estrogen dominance, and keep these women healthier. Also, long-term side effects have not been fully studied, so there could be other side effects. Real progesterone has none of these side effects. Progesterone cream is applied to women in areas where they typically blush like the palms, shoulders, inner arms, neck and face. USP progesterone is fat-soluble, which means it is absorbed through these areas into capillary blood. The recommended dosage depends on the levels of progesterone in the cream. The usual progesterone dosage is one or two teaspoons once or twice a day, depending on the cream being used. It is recommended to cycle through the areas the supplement is applied to. 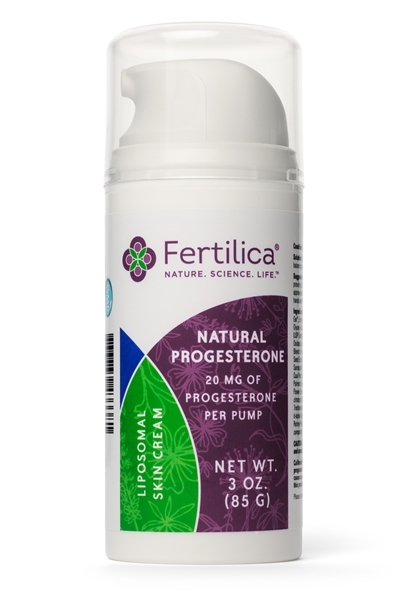 One of the best progesterone creams on the market and the one that I personally use and recommend is Fertilica Natural Progesterone Cream. It is the best quality for the best price. Find out why by clicking the link above. It comes with clear directions as to the dose to use for which ailment and how to apply it correctly, and more. There can be some negative side effects to natural progesterone therapy, too. Over time, progesterone can build up in the woman’s fat tissue. As the build-up grows, this can disrupt several hormones. The benefits of progesterone cream can usually be seen within 3 months. After that, cut back on the dosage to dispell any possible side effects of progesterone build-up. Before deciding on a form of natural progesterone therapy, make sure to consult your physician to see if using progesterone cream is right for you, and what progesterone dosage will be most beneficial.